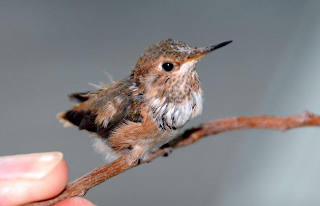 Our Baby Hummingbird is Released! Two weeks ago, Mr. Yollis discovered a baby hummingbird stranded in the dirt in the backyard. The tiny bird was covered with ants. The little hummer was helpless and the nest could not be found. Mr. Yollis cleaned the bird up, placed him in a warm box, and fed him sugar water through a dropper every two hours. 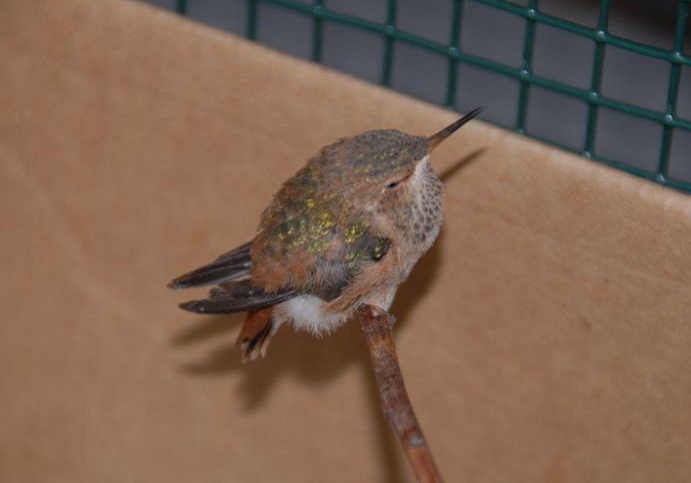 Mr. Yollis went back out into the yard and got a twig for Birdy. 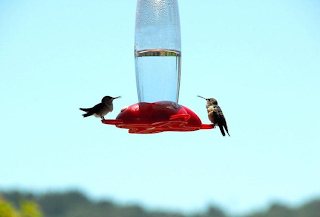 Hummingbirds like to perch. 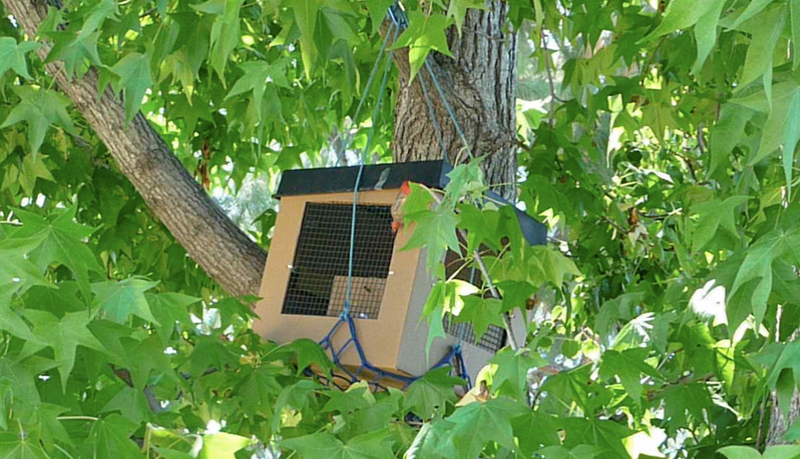 With a nice temporary home, complete with viewing areas and a perch, Birdy started to grow stronger each day. 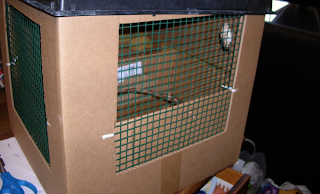 Below is a video of Birdy's home. He flaps his wings, but is more than a week from being able to fly. Over time, Birdy grew and strengthened his wings. Mrs. Yollis ground up a few fish flakes and added the powder to the sugar water. 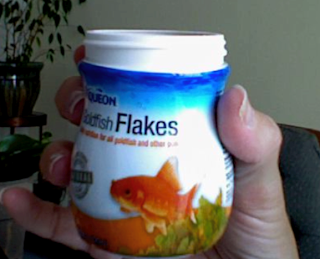 The fish flakes provided the bird with protein. Usually the mother provides protein to a baby in the form of regurgitated bugs. After two weeks, Birdy learned to fly. He would drink through a dropper while sitting on his perch. Next, Mrs. Yollis moved the dropper up. Birdy learned to fly AND drink at the same time. Mr. and Mrs. Yollis have learned a lot about hummingbirds. 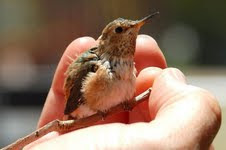 For example, they learned that hummingbirds go into a torpor every evening. A torpor is a mild hibernation. 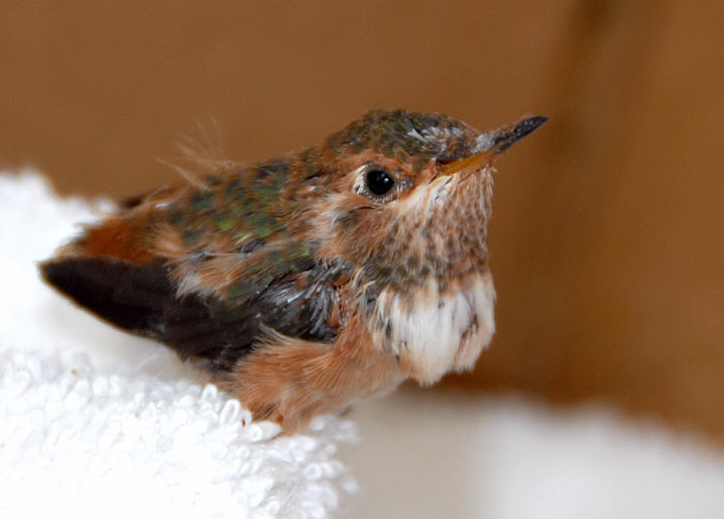 The body temperature drops, the metabolism slows down, and the feathers fluff up to hold in body heat. A torpor helps the bird withstand the night with no food. Mrs. Yollis found out what a torpor was one evening. 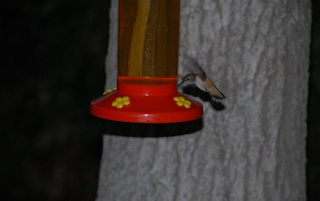 She went down to give Birdy a final feeding for the night. He was so puffy, she thought Birdy was dead! Notice how round he is! Finally, Birdy could fly and was ready to be released. 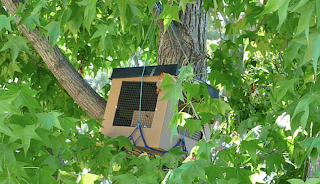 The night before Birdy was released, Mr. Yollis put his box up in the tree where Birdy's mother probably still lived. Birdy woke up to life in the tree! 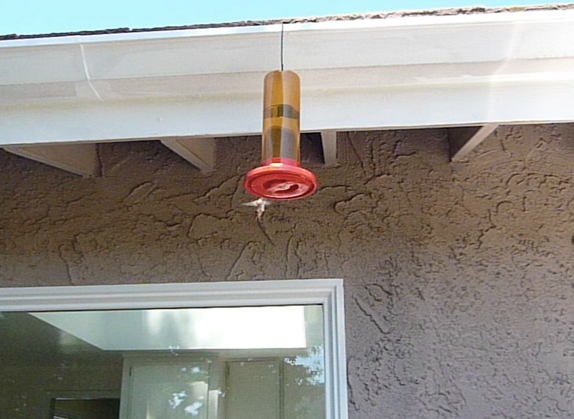 Once Birdy was released, he flew to the hummingbird feeder. 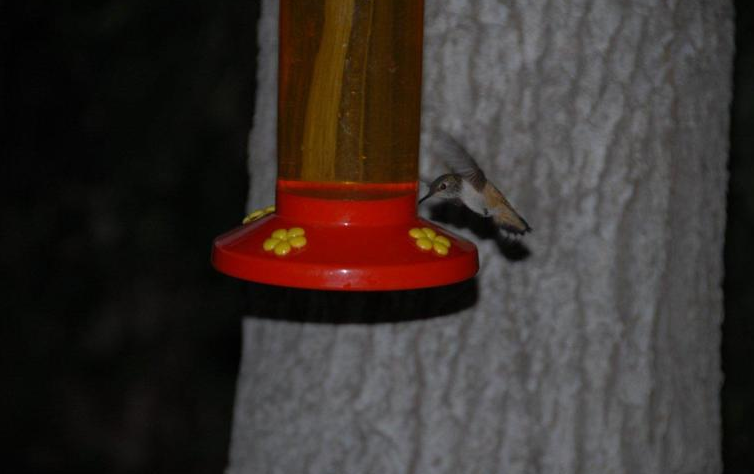 The feeder was larger than he was used to and he had difficulty drinking from it. We hoped he could learn from the other hummingbirds, but many of them scared him away. Mr. and Mrs. Yollis felt so sad for Birdy and feared that he would not be able to survive on his own. After two hours of flying around the yard without food, Birdy settled on a perch. He was tired and hungry. He sat and chirped for food. He chirped, and chirped, and chirped. 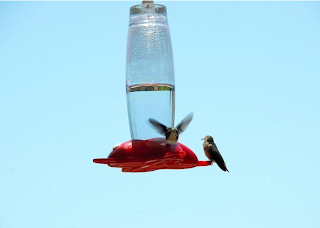 SUDDENLY, down swooped another hummingbird! The hummingbird flew around Birdy and was forcing him to the ground. Mr. and Mrs. Yollis thought that Birdy was in trouble. 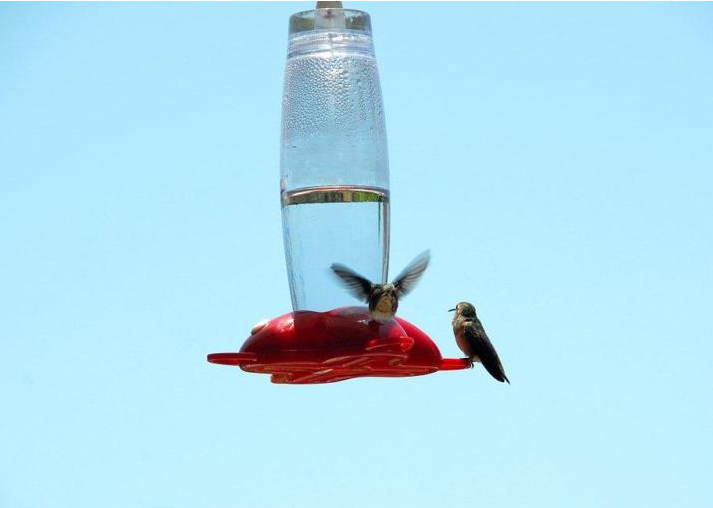 Then they realized that this new hummingbird was feeding Birdy! She recognized the cry and came to feed her baby. For the last two days, Birdy has been learning about flying and feeding from his mother! Now Birdy is on his own! What a happy ending! Mr. Yollis, Mrs. Yollis, Birdy, and his mother are very happy! 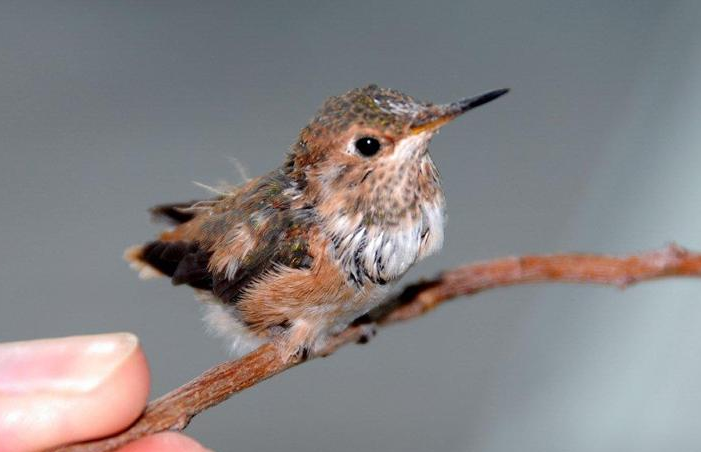 Do you know any facts about hummingbirds? 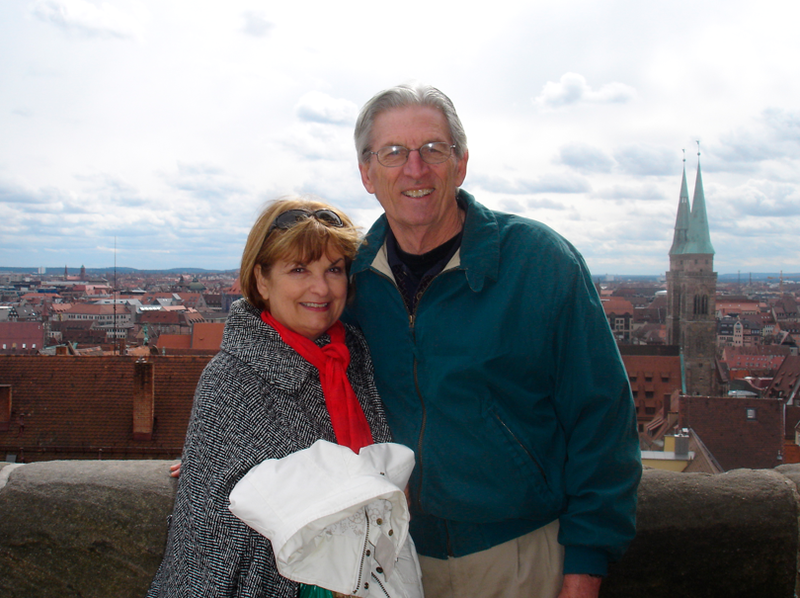 Family Blogging Month Winner ~ Gal's Camera Tips! During the month of April, Mrs. Yollis' class held the first annual April is Family Blogging Month. The top three winners for the month won their own post here on Mrs. Yollis' Classroom Blog. Gal won first place and here is a wonderful post she created about shooting quality photos and videos! If YouTube is blocked, here's the movie on Vimeo. Gal Teaches About Capturing Digital Images from mrsyollis on Vimeo. Do you have any questions for Gal? Do you have any more good tips for taking digital images? 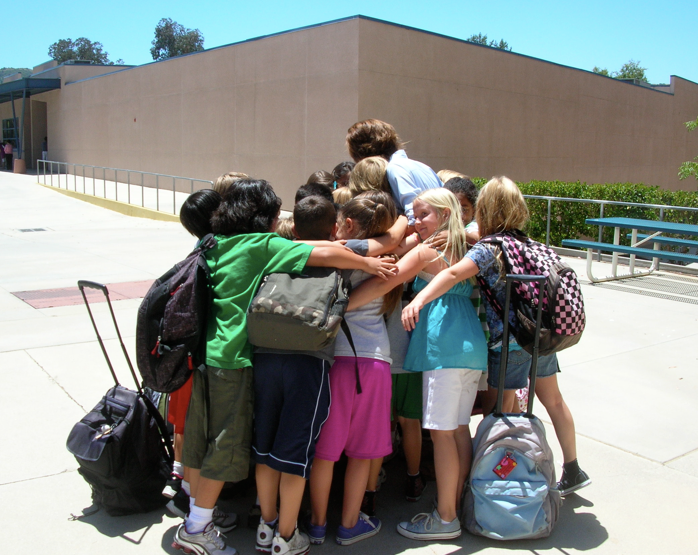 June 15 ~ School is Out! Which animal was your overall favorite and why? 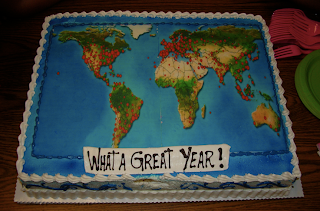 The Goodbye Party Complete With a ClustrMap Cake! Room moms Mrs. Scott and Mrs. Regan really know how to put on a party! 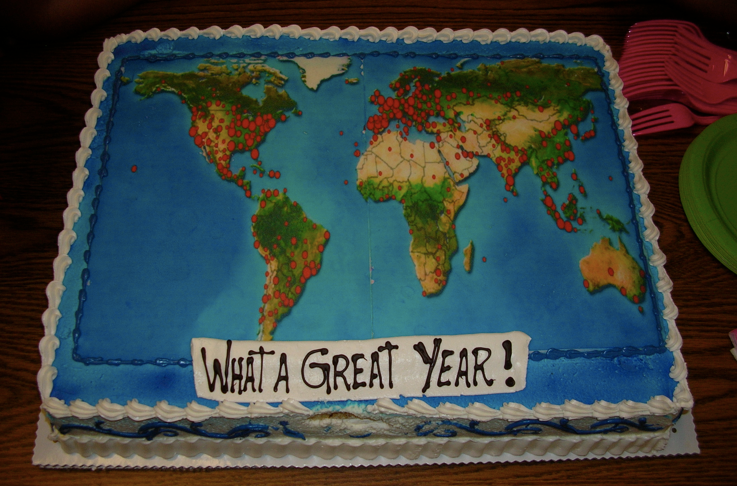 A fantastic Clustrmap cake celebrating our 21,489 visitors! 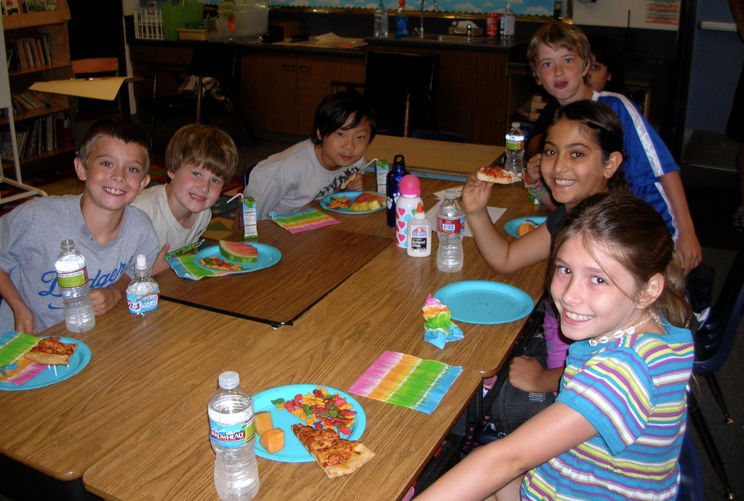 Delicious pizza, yogurt, watermelon, vegetables, fruit, and goldfish! 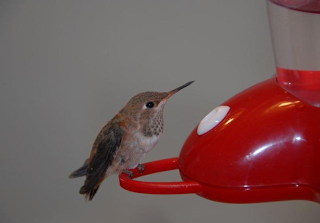 Even Mrs. Yollis' orphaned hummingbird was there! 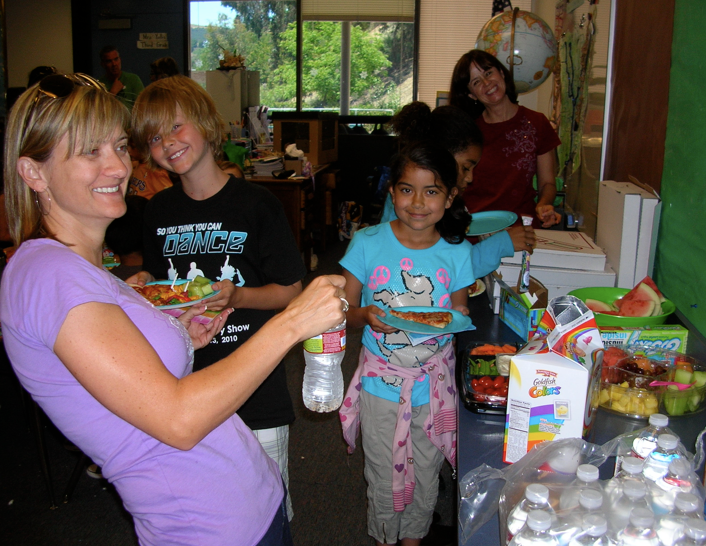 Thanks room moms and parents for a great end-of-the-year party! What part of the world did you eat? Only half a day to go! The fabulous Mr. B. has done it again! Here is the third grade song, True Colors, and the grand finale of the school, Man in the Mirror. Today is Mrs. Yollis' birthday and her students and their parents surprised her with a party! They had some delicious treats and a special birthday cake! The biggest surprise of all left Mrs. Yollis dumbfounded. 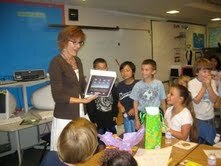 The class gift was an iPad! This iPad is a wonderful complement to the technology already used in the classroom! 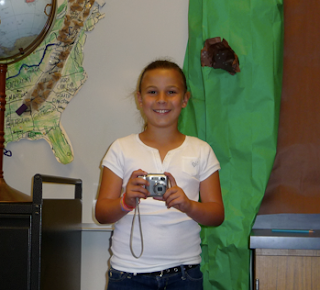 Mrs. Yollis can't wait to make more classroom movies and blog posts on her new iPad! 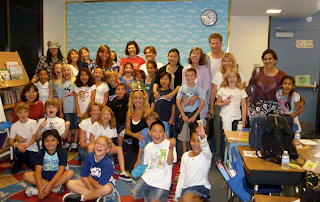 Thank you parents and students for your support, your encouragement, and your generosity! Two months ago, Mrs. Yollis had the first annual April is Family Blogging Month!" Comments were collected from: moms, dads, grandmothers, grandfathers, great-uncles, great-aunts, uncles, aunts, brothers, and sisters! 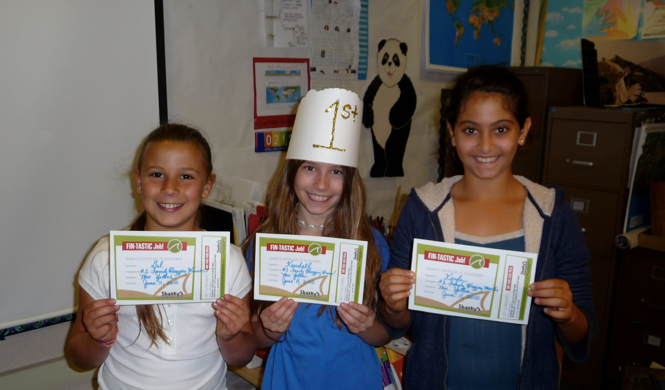 It was so much fun, the students voted to continue until Friday, June 11! A certificate for a free meal at a local restaurant! What do you think of our winners? How did you encourage your family to participate? Visit: Death Valley National Park! Although the name is less than inviting, Death Valley is a beautiful place. Take a look at some photos from a recent trip to this beautiful national park. Have you ever visited Death Valley National Park? What surprised you the most about this location? Learn About a Fennec Fox and Desert Tortoise! Walk with us on the wild side and learn about two more crawling creatures! What did else did you learn about the fennec fox and the California desert tortoise? 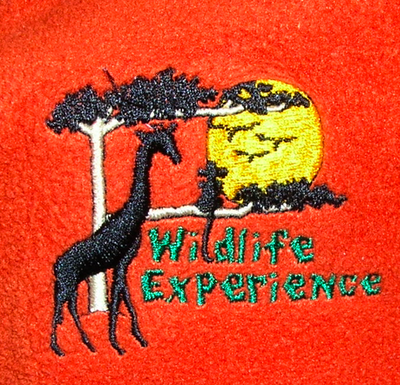 What have you enjoyed most about our Wildlife Experiences so far? Maori Raukau Stick Game ~ Thanks Room 8@Melville School! 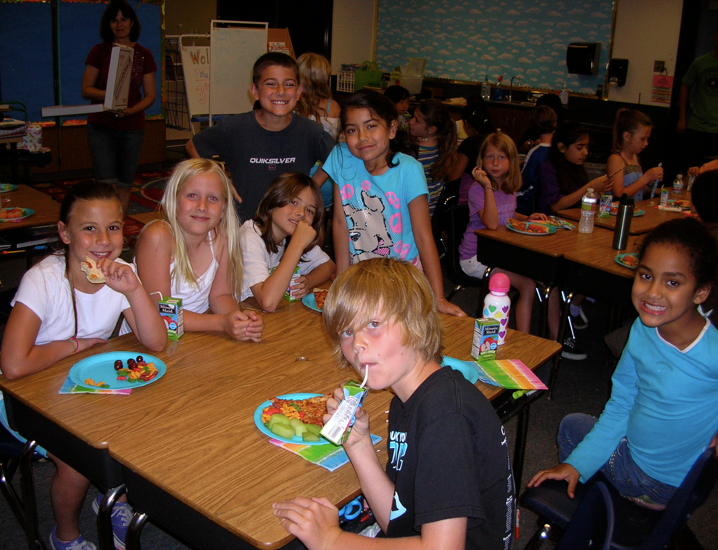 Mrs. Yollis' class loves to learn new things. Here is the Maori Stick Game we learned from our friends in Room 8@Melville Int. School in New Zealand. First, we watched their tutorial below. We're not perfect, but we've had a good time! Skype: Show-and-Tell Party With 2KM! 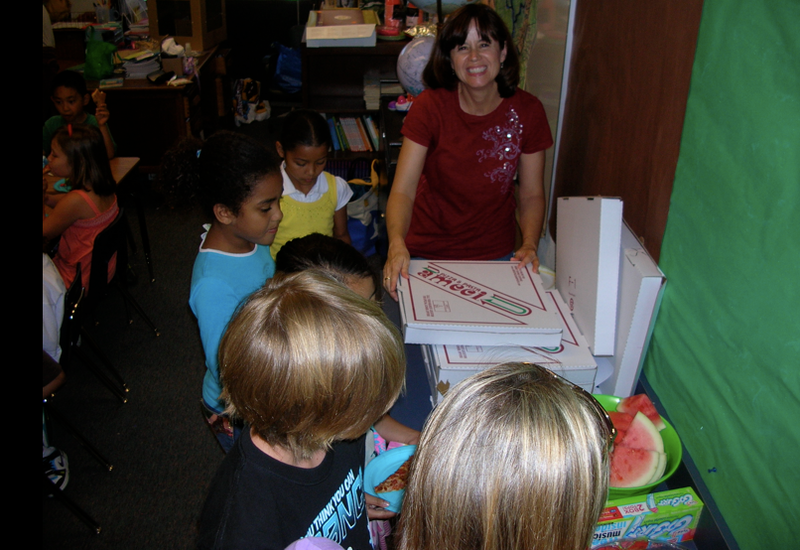 The school year is about to end for Mrs. Yollis' class. 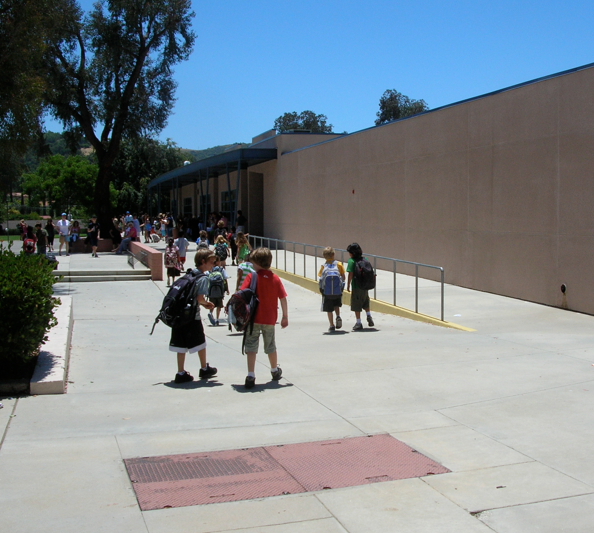 They have skyped with Miss McGeady's class a couple of times in the past, however because of the current time zones, they could not Skype during school hours. Due to the enthusiasm of the students and the support of parents, all hope was not lost! 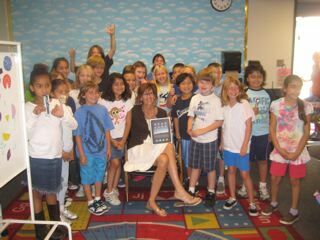 Today 2KM came to school one hour early and Mrs Yollis’ class stayed back from school late for a special Skype session. Here it is on Vimeo! 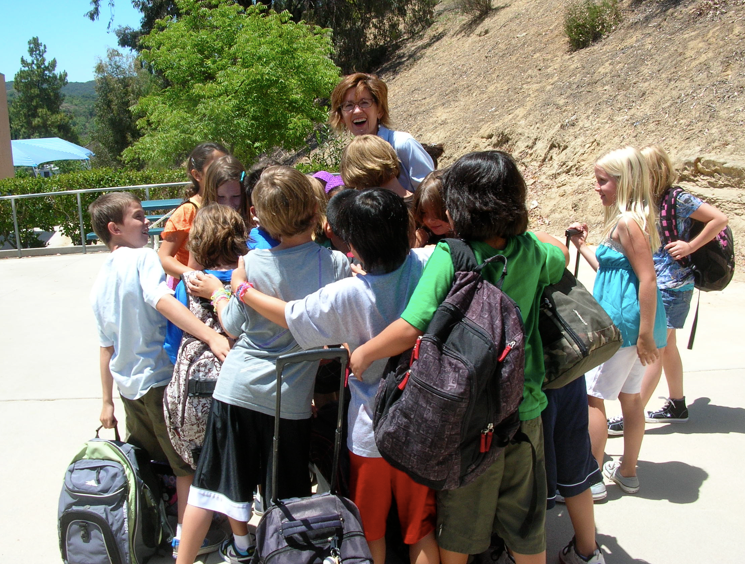 During our April is Family Blogging Month, Mrs. Yollis' blog received numerous comments from parents, siblings, aunts, uncles, and grandparents. 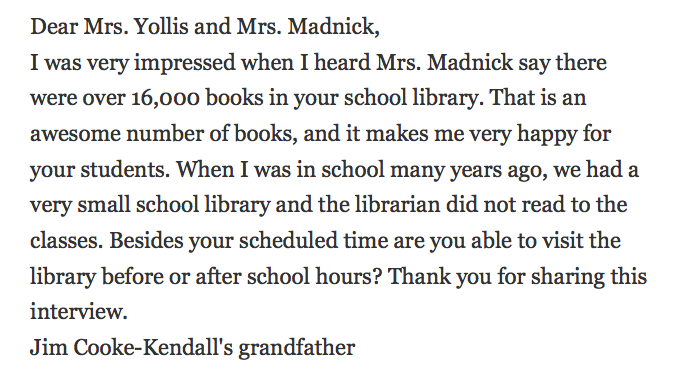 Kendall's grandparents, Mr. and Mrs. Cooke, were active commenters right from the start! They have become a big part of this educational blog! Not only do Mr. and Mrs. Cooke comment often, but they set a standard of excellence in content. They always add new information to a post and often end with a question that will start a conversation. 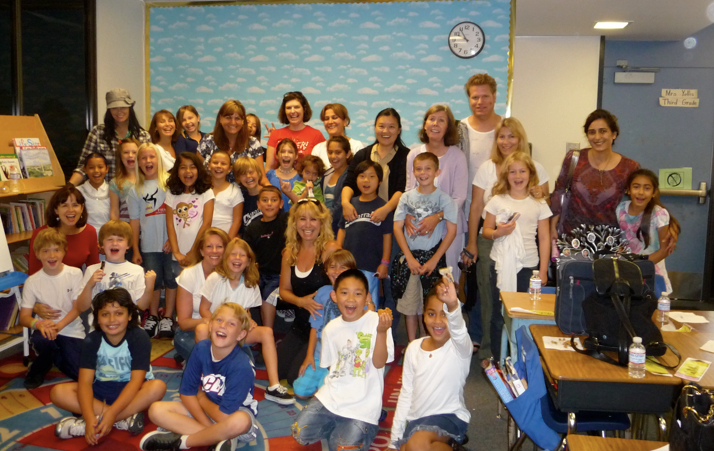 Mrs. Yollis and her students thank Mr. and Mrs. Cooke for their interest and their active participation in this blog. What do you think of Mr. and Mrs. Cooke's comments? Have you ever commented back to them? New Post Over On Collaboration Corner! 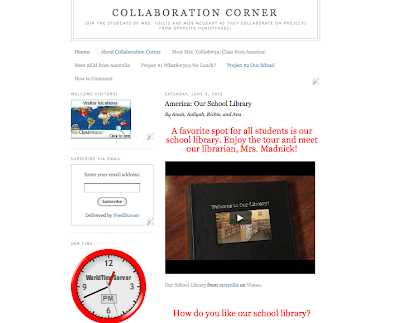 Please be sure to visit our other blog, Collaboration Corner! 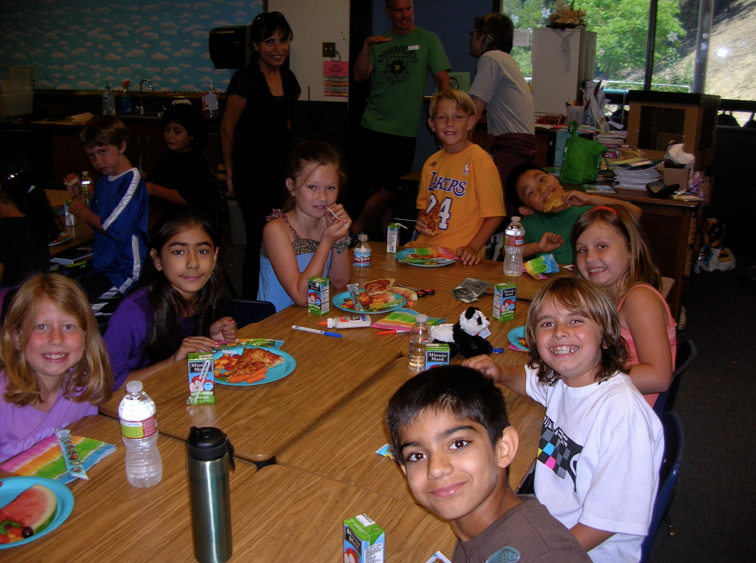 This is a blog where we collaborate with Miss McGeady's class in Australia! Here is a link so you can view the new video about our library. We invite you to leave a comment there! Native Animals: A Skunk and a Barred Owl! Today Miss C. was back with more interesting local animals! 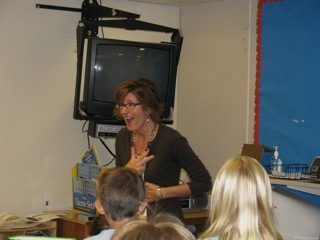 If you want to learn more about animals, visit Mrs. Yollis' website. There are animal track links and more on the site. Here is a great video of a barred owl hooting! What facts can you share about skunks or owls? Have you ever seen animal tracks? 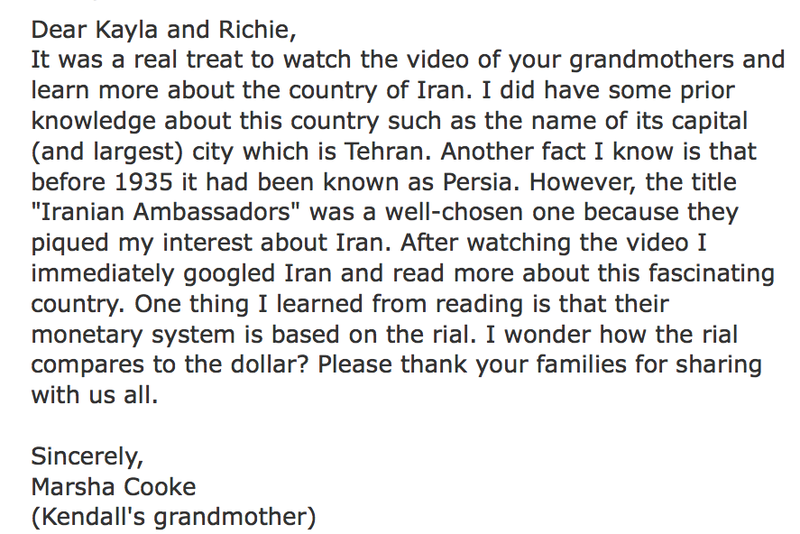 Kayla's Grandmother and Richie's Grandmother Teach About Iran! 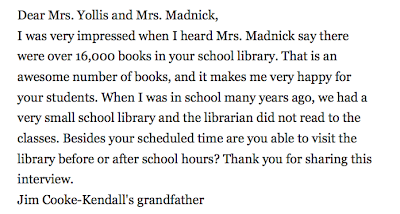 During our April is Family Blogging Month project, many grandmothers visited to share about their background. Grandma Marty from Australia came in, Ethan's Halmoni from Korea visited, and Ayush's grandmother from India stopped by! 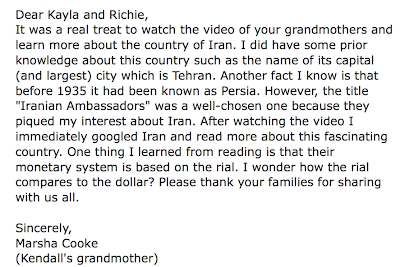 Recently, Kayla's grandmother and Richie's grandmother shared some information about Iran! They taught us some Farsi! Have you ever eaten dolmeh? Do you know any facts about Iran? 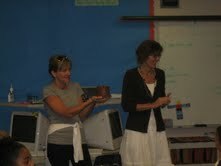 the group from Wildlife Experience will bring ten local wild animals to Mrs. Yollis' class for careful scientific study. Here are some images and facts from our first experience! All of the animals are native animals. That means they are found naturally in our area. Did you learn any other facts about turkey vultures or salamanders? Have you seen either of these animals in the wild?